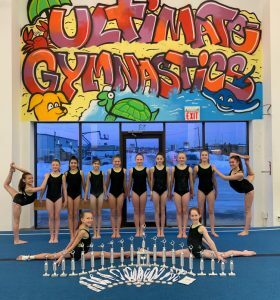 Ultimate Gymnastics trains athletes in our competitive program to compete at various levels including Pre-Competitive, Invitational, and Provincial. Competitive gymnasts develop the required techniques and discipline to compete at their specific level throughout the year, as guided by Gymnastics Ontario and Gymnastics Canada. At Ultimate Gymnastics, our competitive gymnasts learn both creative and technical skills, giving them strength, agility and poise in key areas such as beam, bars, vault and floor routines. Our Competitive coaches determine which program a gymnast will be invited to attend annually. Competitive programs are by invitation-only and training schedules vary according to each program. The regular season training hours for competitive athletes are from July to June annually, with Pre-Competitive training from September to June. A high level of commitment from the athlete and the parent/guardian is expected in our Competitive program. Gymnasts are expected to wear official club issued training and competitive wear. Ultimate Gymnastics believes in supporting athletes of all ages to achieve their personal goals by improving their physical and mental health, building their self-confidence and developing team spirit. And ULTIMATELY, we strive to nurture a lifelong love of the sport of gymnastics! Ask us about our Competitive Programs.